Full Spectrum of Omega Support! Nature's Science Coconut Oil with Omega 3,6,7,9™ is made with natural ingredients and provides a full spectrum of omega support. With certified organic coconut oil and newly discovered Omega-7 this natural plant based formula provides a wide array of healthy fats to support overall health! 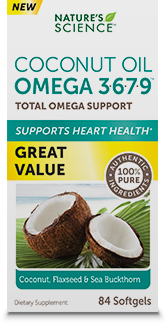 WHAT IS COCONUT OIL with OMEGA 3,6,7,9? Nature's Science Coconut Oil with Omega 3,6,7,9™ is a natural plant based formula that provides a wide array of healthy fats to support overall health.